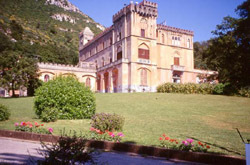 Along the Amalfi Coast, in a splendid garden, full of history and surrounded by oak-trees, olive-trees and beeche trees, there is the famous Colonna Castle, that was inhabited at first by a Benedictine Monastery (1080), and then by the Prince Eduardo Colonna Doria del Carretto (1855). 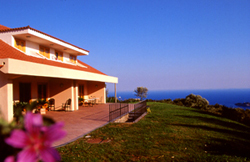 This tourist complex offers its guests the most evocative views of the gulfs of Salerno and Naples. In its garden there is also the ancient church dedicated to Saint Peter, located exactly where -according to the legend- the saint passed through. Near this castle and the tourist complex “Antico Parco del Principe” there is this hotel: its clients can take advantage, for free, of tennis court, small football and beach volley fields. The quite position of the hotel is ideal to rest amongst the greenery. 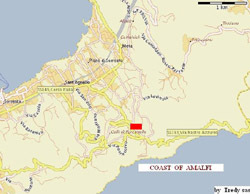 Besides, Positano, the pearl of the Amalfi Coast, is only 5 Km away. The guests from the Hotel can enter free the splendid swimming-pool with a small fun-fair for children. The swimming pool is open from 20 May to 30 September. This recently built is hotel is situated at the beginning of the Coast of Amalfi in front of the island “Li Galli” and near Positano. It is about 50 m. from the secular park where the tourist area “Antico Parco del Principe” is located with the restaurants, the swimming-pool, and the sports area. This hotel provides shuttle bus service and free private parking. The 15 rooms have air-conditioning, Tv and refrigerator. They are different in colours, but all of them are refined. Guests of the hotel have free admittance in the swimming-pool, tennis and beach-volley courts, table tennis of the tourist complex nearby. The Hotel “Antico Parco del Principe” is situated on the Amalfi Coast, near the National Road 163, 4 km (2.5 miles) from Sorrento and 7 km (4.3 miles) from Positano. It is located near a large and quiet garden (20000 acres) and it is part of the tourist complex “Antico Parco del Principe”, where, in the middle there is a castle which belonged to the Prince Edoardo Colonna Doria del Carretto (1855). Near the fortress, then, there is still a small ancient church, the stables and high walls which still surround the estate. The magnificent complex overlooks the landscape and the ocean in the distance. It is an incredible place where Mother Nature, like a divine lady, shows all her beauty: high mountains (“Milky Mountains”) behind the Castle and the Residence, luxuriant holm and oak trees, and an intense blue all around: the sky and the ocean. The chain of mountains of the Sorrento Peninsula is called “Milky Mountains” because in Roman times the local people of the area used to produce milk and cheese on them: still nowadays a typical cheese of this territory is the well-known “mozzarella”. After entering the gate, one is sorrounded by a lot of centuries-old holm and oak trees and a driveway which goes uphill gradually. Beyond a bend is the Chapel of Saint Peter. It was the private chapel of the princes who lived here. According to the legend, it rose on the spot where Saint Peter stopped to rest during his journey to Rome. To the right-hand side, suddenly there is a large area without trees, but only a lawn where a massive Castle rises sumptuously. It is a magic place, close to Sorrento and Positano, it feels like being in most peaceful place of the world: here time has stopped. The castle, with its towers and its battlemented walls, it is the historical heart of the tourist complex. The Colonna Castle, which dates back to the year 1080, used to be a Benedictine Abbey. Later, it became the famous historical residence of Prince Eduardo Colonna Doria Del Carretto. On one of the walls near the fortess still has the coat of arms of the noble family. in seeing it one understands why the prince loved to abandon the frivolous world to take refuge in this Earthly Paradise. In past times, famous scientists and personalities were welcome here, whilst, nowadays some rooms of the castle and the garden are open to the public and house a romantic and elegant restaurant. 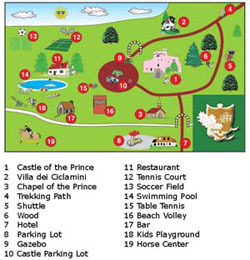 From there, some narrow foot-pathes lead in different directions: the swimming-pool, the tennis courts, the beach-volley field and the Vicalvano Apartments, beyond the Castle. The air is clear and perfumed and the weather is mild all the year round. The tourist complex “Antico Parco del Principe” is an ideal place for those who wish to banish all their cares and look for a magic, quiet place, away from the stressful rithm of the everyday life. The spot is absolutely amazing and obviously cars are kept away. But at the same time a large garden (20000 acres), a nice swimming-pool, tennis courts, a beach-volley field, a mini-soccer field, a table-tennis, restaurants and bars make any stay very enjoyable. These facilities can be used for free and they are shared among the guests of this exclusive complex, who reside in the buildings that are located in the park. In particular, the swimming-pool of the tourist complex “Antico Parco del Principe” is considered one of the most beautiful in Sorrento area. It is very large, 14 m. (46 feet) by 26 m. (85 feet), and it is equipped with a large solarium. There is also a smaller pool close to the big one and a slide, just for kids. The swimming pools work from May, 20th, until September, 30th. 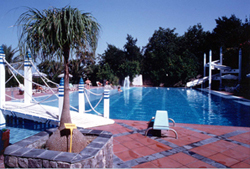 The deck chairs of the swimming-pool will be offered for free to the clients of the hotel. Near the swimming-pool, table-tennis table is available. And for childen some merry-go-rounds are waiting for them. The tennis court and the mini-soccer field too are availble for free. They are close to the swimming-pool and the racquets and balls for playing tennis or the ball for playing football, are available at the bar of the swimming-pool: the staff will be glad to lend them for free. Another chance to enjoy Yourself is the beach-volley field. The use of this sand court is free and it is totally surrounded by beautiful oleander plants. 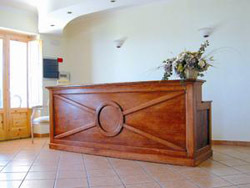 This place is another of the amenities where one can spend free time and meet the other guests of the complex. For thoes who like trekking, a good idea is to explore the surroundings walking along the foot-path which starts from the Castle and goes as far as Amalfi: that itinerary is called “the path of the Gods” for its beauty, because on the way one can see at the same time the Amalfi Coast and the Sorrento one. For those who are gourmet orientated, extraordinary dishes can be enjoyed in the Ristorant of the Castle, where the atmosphere and the frescoed rooms are absolutely unique. For thoes who prefer fish, the ideal Restaurant is “Silenzio Cantatore”, which is near the tourist Complex “Antico Parco del Principe”. For those who wish to try one of the best pizzas in Sorrento can go to the Restaurant “Zio Sam” (500 meters away from the hotel). 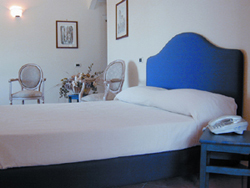 WHY SHOULD ONE CHOOSE THE HOTEL “ANTICO PARCO DEL PRINCIPE”? This hotel is located on the Amalfi Coast, one of the most beautiful natural environments in the world, so beautiful that it is considered “patrimony of the world” (UNESCO). 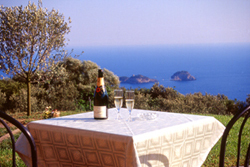 It is in a magic position, near a Castle of a Prince, in a quiet spectacular location with a sea-view. It is advisable for tourists who love to stay in the countryside and away from the noise of the cities, but at the same time they wish to visit the tourist attractions of Sorrento area. In fact, near the hotel “Antico Parco del Principe”, there are the National Roads 145 and 163 which take to Pompeii, Naples, Sorrento, Positano, Amalfi and Ravello. Moreover, the price of a room is very reasonable and their guests can stay in a splendid place and they can use for free the amenities of the nearby complex ”Antico Parco del Principe” (50 meters away): swimming-pool, tennis courts, mini-soccer field, car parking, trekking path etc. Besides, in the vicinity - approximately 300 m. (328 yards) away, are the bus stop, some shops and restaurants. From Rome take the \"A1\" south (Napoli) and, after leaving Naples, take the \"A3\" Napoli - Salerno (Not Tangenziale Napoli). Follow the brown sign “Penisola Sorrentina”. Exit at Castellammare di Stabia and follow Sorrento. There is a shuttle that connects the Airport with the main railway station in Rome. From the main station there are several trains to Naples (The trip takes approximately 2 hours). In alternative, (only on week days) the “Marozzi” bus leaves from Tiburtina train station at 7:00 am and 3:00 pm: the bus takes directly to Sorrento ( Euros 15.99). From Naples airport you can take a taxi or bus to the railway station at Piazza Garibaldi. At the main train station board the local Circumvesuviana trains which leave for Sorrento every 20 minutes all day. In alternative, from Naples Capodichino Airport you can take the bus “Curreri”, that takes you directly to Sorrento; it departs at 9:00 am – 11:30 am – 01:00 pm – 02:30 pm – 04:30 pm – 07:00 pm. (The trip takes approximately 1 hour).